Left Bank Gallery is thrilled to present our newest show Flourish, featuring the widely recognised and celebrated artists Leah Bartholomew, Tania Blanchard, and Annabelle Lambie. This stunning and luminous exhibition showcases these women’s talent for capturing the artistry and essence of the natural landscape around them, and transforming it into tangible pieces of resplendent beauty. With varied processes and techniques ranging from impasto paints, to paper collage, and digital illustration—all three artists achieve a harmonious composition leaving the viewer with an anticipation for the arrival of Spring. It's fresh. It's colourful. It's bold. It's not to be missed! This visual feast of art will be launched on Opening Night from 5PM to 7PM on Friday 12th October, 2018 at Left Bank Gallery. Leah Bartholomew is a practising artist and designer based in Coolangatta, QLD, Australia. Bartholomew’s artworks are an abstract representation of the beauty found in the landscape and life of her local environment. Her optimistic, colourful artworks are a response to her daily interactions with her local base, Coolangatta, QLD and Northern NSW. Her vast paintings begin as small torn paper collages, an intuitive puzzle of unexpected colours and feelings that take shape based on the influences of her environment and mood. These collages may represent the colours of the weather, or how the warmth of the rocks on the beach felt, or the blinding brightness of an electric blue sky. Each day is different and her affinity with the landscape provides endless material to respond to. Leah’s work is easily recognisable by her clean, bold style and sophisticated and unusual colour palette. Tania is an artist and graphic designer with a degree in visual arts, and a diploma in graphic design. She loves to paint extremely textured, boldly colourful scenes inspired by nature, where she composes scenes by layering impressionistic impasto dots. Drawn to texture, she adds multiple layers to her canvases to add depth and dimension to each piece. Enjoying the exploration of colours and composition, her use of colours can be harmonious, but at times discordant colours come together to make the viewer’s eyes zing. Through this, Tania creates a dance between colour and texture.Tania paints pieces for both her stockists (principally Kira and Kira at Burleigh) and accepts commissions. 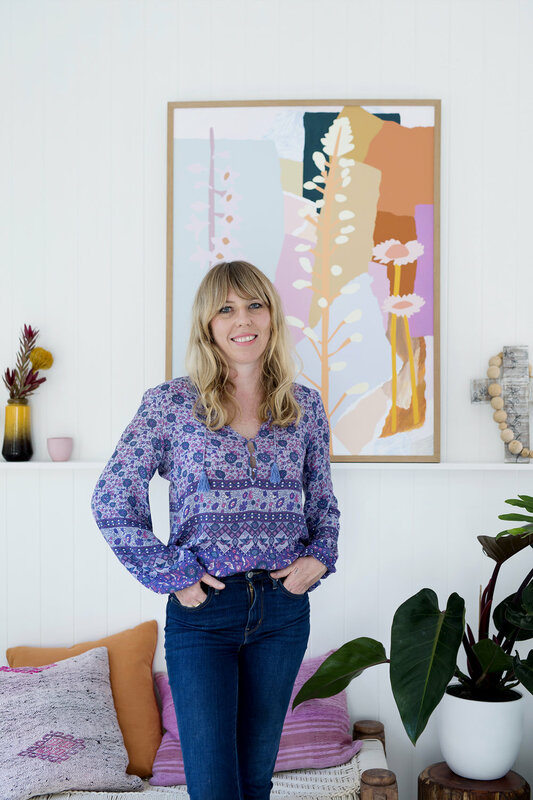 Her work has also been featured in the National magazine "Home Beautiful" as well as the prestigious architectural magazine “Queensland Homes”, and one of her works was featured in 2017’s season of The Block. Annabelle Lambie is a graphic artist & commercial illustrator based in Tokyo, Japan. Her work documents her appreciation of the nature of her surroundings. While in Australia, her work was based on coastal life in Burleigh Heads and native florals, however, since moving to Japan, Annabelle's work has taken on the diverse cultural reality of life in Tokyo. Annabelle's artistic practice encompasses graphic art / design, textile design and commercial illustration with a love of ceramics, floristry, photography & painting.